Seen in the window of a nearby conservative evangelical bookstore both the familiar "Christian" flag and a new design I had not seen before -- the same as the S&S but with a white "ichthys" fish symbol in place of the stars in the canton. I have seen a blue flag, with red letters (fimbriated in white): "JESUS IS LORD"
Thus far, 47 flags have been produced since its introduction in July of this year. Of those, about 31 have been given to various individuals, one is flying from a flagpole in my front yard and one is on my desk at work. The flag is mentioned in a brief article of the current issue of The Mennonite magazine and my hobby has become sending emails about the flag to pastors and academics locally, nationally and a few internationally, with the end goal of achieving some level of international acceptance. FOTW was alerted to a "new" Christian flag by "treelife", as posted at http://www.cafeshops.com/cp/store.aspx?s=ChristFlag. The church behind the flag seems to have the website www.tolag.org/Knights.htm and to belong to the Assemblies of God - so the flag would possibly not be used outside that particular branch of Christianity. The design is a narrow square red cross of St. George, overlaid with 13 gold, 7-pointed stars in a circle, all on a white field. The link is a catalog page, not specifying denomination, of assorted novelties decorated with this design (which looks, from a distance, like a Red Cross or medical logo). But nowhere were there any actual flags for sale! One is curious whether this is a square flag, as the picture implies. One also wonders about the significance of the design elements: 12 apostles plus Christ for 13 stars? The 7-pointed star is reminiscent of Masonic usage (vide US Bennington) or Islamic symbolism, but could well stand for the 7-day week and hence the Sabbath. This [flag] has the [design] problem of the gold (or yellow) small stars on white, which similarly disappear. The site did actually mention reasons for the "change", as well as having a link to a site which has lots of meanings associated with the flag and a particular group/program "Knights of the Warrior Bride". The whole question of "changing" the Christian Flag is of course dependent on what you think the point of such a flag is. This is more a case of one group (or more) deciding to use a different flag. The question for this group is what is the symbolism of the flag? It doesn't seem that they have a problem with the deliberate symbolism of the original Christian Flag, rather that they have a point they want to make, and they can make it using the symbolism of a new flag and some unintended symbolism of the old flag, which they presumably feel accidentally reflects/is reflected by the attitudes of many Christian groups/people. On the shop site, they say that on the old flag, the church is tucked away in a corner, with Christ within the walls, and the "harvest field" of the earth is left outside. 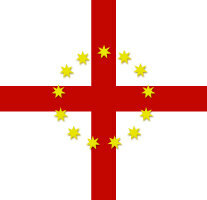 The "new flag" is meant to show Christ throughout the 4 corners of the earth, (with the stars representing the church?) If you see the purpose of a Christian flag as to be a symbol to remind/teach people of certain things, this would probably be a good reason for a new flag. If you see the purpose of the flag as to represent God's people, then you may see the new flag as a better symbol. Whether it is worth "changing" the flag would depend on how much the "original" is seen as *the* Christian Flag, rather than just a flag which symbolises Christianity. iii) the "promise of our marriage to Christ"
iii) the 7 points of the KWB motto and code. The cross is red for Jesus' death/blood and extends across the whole flag because there is no end to Jesus' love. The four corners are "the four corners of the earth, white and ready for harvest". The flag is pictured both square and with greater width than height.